The Gillard Government's new ministerial line up places greater emphasis on the importance of the Not for Profit Sector. The Prime Minister has announced her front-bench line-up including a new ministerial position dealing with social inclusion as well as a number of other portfolios with significant emphasis on issues relating to the Not for Profit sector. The swearing in ceremony also saw some last minute changes and inclusions to the titles of several Ministers and Parliamentary Secretaries dealing with the Sector. The new ministry sees the emphasis shift the role of Parliamentary Secretary for Social Inclusion, held before the election by NSW Senator Ursula Stephens, to a ministerial portfolio now held by former Housing Minister, Tanya Plibersek. The change to bring social inclusion under ministerial control follows the Labor party's committment during the election campaign to progress Not for Profit reform. In another move, Mark Arbib, one of the factional powerbrokers responsible for bringing down Kevin Rudd, was given a (non-cabinet) ministerial portfolio that the Prime Minister has described as having "greatly increased responsibilities" for indigenous employment and development, sport and social housing with a special emphasis on homelessness. Port Adelaide MP, Mark Butler has been sworn in as Minister for Mental Health and Ageing. 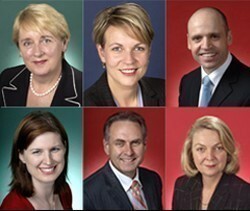 Jenny Macklin has kept her portfolio of families, housing, community services and indigenous affairs. Three new Parliamentary Secretaries join the Gillard team and will deal with issues that affect the sector. Two Parliamentary secretaries, Jan McLucas and Julie Collins take on community services and indigenous affairs and South Australian senator Don Farrell takes on sustainable populations and communities. Julia Gillard says both McLucas and Collins will work within Jenny Macklin's portfolio and it will be up to the Minister to allocate the various responsibilities. In a last minute change to the line-up the title of Parliamentary Secretary for Disabilities and Carers was also given to the Queensland Senator, Jan McLucas. Opposition Leader Tony Abbott announced his Shadow Ministry promoting Victorian Senator Mitch Fifield as the new Shadow Minister for Disability increasing the emphasis on the sector up from the role of Parliamentary Secretary. Fifield says this is something that the disability sector had been calling for for some time and Labor's Bill Shorten had told many people in the sector that he would argue for disabilities to be given ministerial rank. Fifield says that didn’t happen when Julia Gillard announced her new frontbench line-up and actually forgot to appoint a frontbencher specifically for the role of disabilities. Fifield is also the Shadow Minister for Carers and the Voluntary Sector having served as a shadow parliamentary secretary for the past 19 months. The Centre for Social Impact (CSI) has welcomed the appointment of Tanya Plibersek as the Minister taking responsibility for driving the Gillard Government’s Social inclusion Agenda. CSI CEO Prof. Peter Shergold says the new minister will be a strong advocate for action. As well, Prof Shergold says the appointment of Mark Arbib will now ensure that the complex issues of Social Housing and Homelessness are brought to the Cabinet table and Jenny Macklin, who retains Families, Housing, Community Services and Indigenous Affairs (FAHCSIA), will create a strong team to give further impetus to addressing inequality and marginalisation. He says CSI awaits further details on the division of responsibilities between the two new Parliamentary Secretaries for FAHCSIA, Julie Collins and Jan McLucas. The Centre for Social Impact is a partnership between the Business School of the University of New South Wales, the Asia Pacific Social Impact Leadership Centre of the Melbourne Business School, Swinburne University of Technology and the University of Western Australia. Prof Shergold says that for the community sector’s sake it is imperative that the Government’s election commitments be set in place as soon as possible: namely establishing a new Office for the Non-Profit Sector, reducing bureaucratic red tape on Not for Profit organisations, scoping the role and design of a one-stop-shop regulator and making a 36 million dollar investment in Social Innovation Co-operative Research Centre projects. Finally CSI has paid tribute to the commitment and enthusiasm of the previous Parliamentary Secretary, Ursula Stephens. Prof Shergold says she did a fine job consulting with community organisations and ensuring that their diverse voices were heard. I'm somewhat surprised that Senator Kate Lundy wasn't included in your summary. As the ALP site says, "Senator Lundy continues to be a strong advocate for the use of the internet, digital technology and ICT innovation to strengthen the Australian economy for future growth, to transform public engagement with government and to enhance social inclusion within our communities." Given her high profile in Gov 2.0 initiatives and the fact that Senator Conroy has entirely ignored the third sector in any consideration of the digital economy, I would have thought this was welcome news indeed.